I finally found some time for making photo’s of the girl with her new dress, although she wasn’t so happy with that. She was happy with her new dress, oh yes, but I wasn’t suppose to put her on the ground. She got mad, throwing herself on the floor, making faces…but I did got some shots! 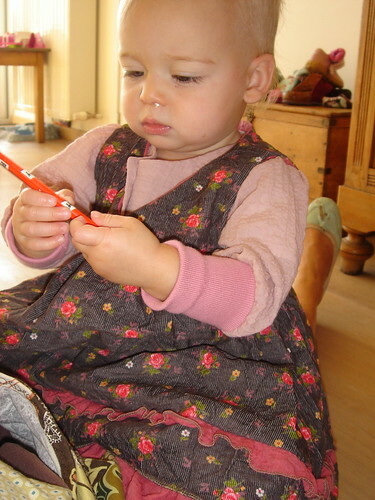 The shirt she is wearing under her dress is made from a pattern from the same ‘knippiebaby’. But it was only described until size ‘6 months’. So I made it a little wider and a little longer (at random of course, I don’t like measuring), and…it fits perfect! !